3 Restaurants, 2 Bars, Concierge, Health Club & spa services, outdoor pool and terrace. Meetings for 500 persons or banquet for up to 400 persons. The hotel's key location and luxurious facilities are complemented by excellent service from a team of multi-lingual staff. Direct access via tunnel & covered walkways to 1,000 exciting shops, 300 mouth-watering restaurants, 4 banks, a post office and Carrefour Hypermarket. 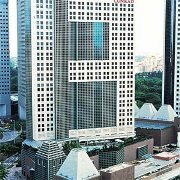 The hotel is adjacent to the SUNTEC, Convention and Exhibition Centre. It offers 35,000 square metres of conventions & exhibitions & 31 meeting rooms.